Somebody please tell me what the hell this sign means. Well, I've figured out what the sign means. 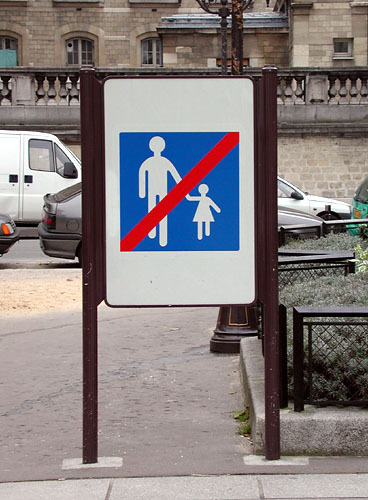 After seeing it all over Europe, I realized that it means the end of a pedestrian-only zone (not "No Women and Children"... heheh). A slash through a road sign means the end of that road sign. As you leave a town, for example, you would see a sign with the name of the town with a slash through it. And the above sign, without the slash, means the start of pedestrian-only zone.